Cabomba caroliniana plant in bloom with above and below water leaves. Ian Pfingsten – USGS .nas.er.usgs.gov (Accessed 11/2017). Cabomba caroliniana is a rooted, submerged aquatic, to 2 m long from a creeping rhizome; branched. 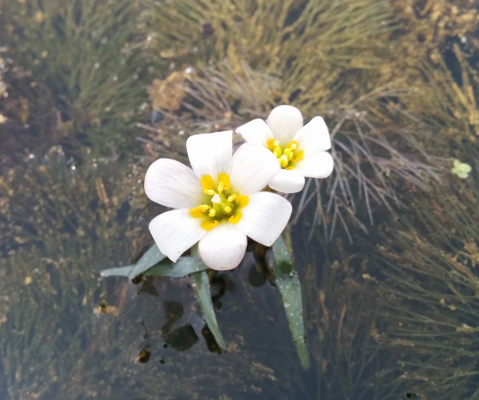 Leaves opposite, stalk to 3 cm, blade to 5 cm wide, round in outline, palmately, finely dissected with linear segments, a few floating leaves, when present, to 2 cm, linear, constricted in middle where stalk is inserted on underside. Flowers white with yellow center, radially symmetrical, about 2.5 cm wide, petals 6, stamens 3-6. Fruit a small, leathery capsule. Origin: Native to southern New Jersey and south. Habitat: Introduced into quiet ponds with aquatic nursery stock, or otherwise introduced in NYC.